The world’s most innovative providers of technology solutions that address the challenges and opportunities of dealing with regulatory issues were named today on the RegTech 100. RegTech (regulatory technology), is now regarded as one of the largest and most important sectors within the FinTech space. As banks and other financial institutions grapple with the costs and complexities of mission-critical regulatory requirements, the RegTech 100 was produced to identify the 100 innovative companies that every financial institution needs to know about in 2018. The 100 companies were chosen by a panel of industry experts who reviewed an analysis of 416 RegTech companies that was undertaken by FinTech Global, a data and research firm. The selected companies were recognized and commended for their innovative use of technology to generate efficiencies and performance enhancements across the compliance function within financial institutions, which spend tens of billions of dollars on the area each year. 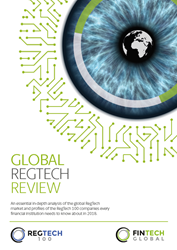 Although nearly half of the RegTech 100 companies are located in the United Kingdom or the United States, the geographical distribution of companies shows how RegTech leadership is no longer limited to the most dominant financial markets. Innovation is flourishing around the world as governments, regulatory authorities and technology hubs combine efforts to foster new RegTech companies. Ireland, Switzerland and Australia, which claim 21 companies between them on the RegTech 100, have already established themselves as RegTech hotspots. Other countries, large and small, are just beginning to make their mark in the industry: Brazil, Bermuda, South Africa, Cyprus, India and the United Arab Emirates are all represented on the list.